Made with zero waste from fabric scraps, this sustainable clutch doesn't skimp on style. A clutch that's equal parts sustainable and stylish makes a serious case for slow fashion. 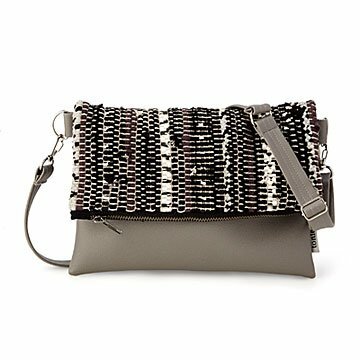 Handmade by artisans in Cambodia who pride themselves on their zero-waste techniques, the textured look of this foldover clutch is the result of a curated mix of tiny fabric pieces that would otherwise be thrown away. It's an elevated take on an eco-friendly accessory that gets bonus points for versatility—experiment with the adjustable, removable strap for endless ways to wear it. Handmade in Cambodia. Vegan leather.